The Battle of Loos, fought in September 1915, was the largest British offensive on the Western Front. Yet neither the British commander-in-chief, Sir John French, nor the general in charge of the attack, Sir Douglas Haig, wanted to fight there: the ground was poor and the strength of the German positions – holed up in fortified mining villages and slag heaps – just too great. Yet with the Allied strategic situation in a parlous state and the Russians on the point of collapse, the need to support the French was recognised by the British secretary of state, Field Marshal Lord Kitchener. The British commanders had little choice but to attack where their line met that of their allies, just to the north of Lens. The men of the London Irish Rifles, at the left of the 47th Division line, would be first out of the trenches. The battalion was famous for footballing prowess, its team roundly beating others of the brigade, so it was perhaps not surprising that their entry into the “great push” would involve kicking leather footballs towards the German trenches. While this was officially frowned upon, one man, Private Edwards, would nevertheless carry a deflated ball into the line; inflating it before zero hour, he would launch the ball with a goalkeeper’s throw, punting it towards the line while his colleagues followed it up. The London Irish would soon drive the Germans from the line. The football had reached its objective; hanging on the German wire, it would eventually find its way back home to the regimental depot. The Man of Loos is a bronze statue on the war memorial of the London Irish Rifles, depicting a soldier in 1915 garb, holding a football. More remarkable is the preservation of the ball itself. Last seen as a deflated leather bag on the German wire, it survived to become a celebrated relic of the Rifles’ involvement in the battle. 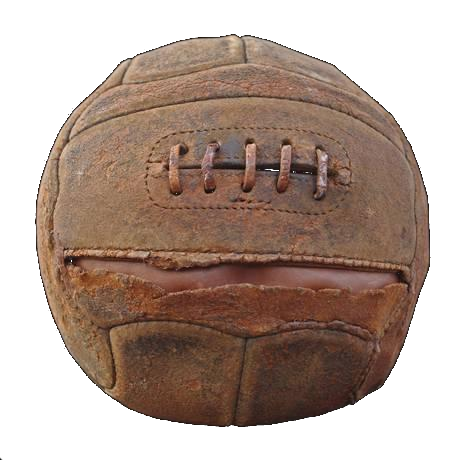 Recently restored, the football was revered at post-war mess dinners and regimental events. Yet despite the celebrated nature of this exploit, it has been overshadowed by the same motivational use of footballs by, for example, the East Surrey Regiment at the opening of the Battle of the Somme in July 1916.